In this work, the Wall family — originally of Anglo-Norman stock — is traced from a fief in Normandy through England and South Wales to Ireland. One of the first knightly families to occupy Irish lands after the Norman invasion of 1170, their history is followed, generation by generation, through the succeeding eight centuries. Thus a unique insight is provided into the ramifications of Irish genealogy and also into the complex system of feudal land tenure, the effects of rebellions and confiscations upon the fortunes of different branches of one sept, and the narrow margin which separated settler from native at many points in Irish history. This account of the Wall family is the most thorough piece of genealogical investigation to be carried out to date upon a knightly family with an Irish background, and is the result of several years of research not only in Ireland, but also in England, France and Spain. The early history is common to all the family, the later follows the fortunes of the principal, or recorded branches in their respective localities. This book, therefore, is also an important contribution to the local history of eight counties, namely Carlow, Kildare, Kilkenny, Galway, Limerick, Tipperary, Waterford and Cork, and to a lesser extent of several more. The first edition of the Wall Family in Ireland 1170 – 1970 was published by Hubert Gallwey in 1970 and the 800 copies printed were all sold before the authors death in November, 1983. The late Mary Gallwey, Hubert’s wife, always felt that the book deserved a much wider readership and agreed to the publication of a second edition. Since then, Mary Gallwey has sadly passed away and I am delighted to dedicate this second edition to her memory. The second edition is printed as a quality paperback of 328 pages with improved design and additional illustrations. Whereas the original text has not been altered, this new edition includes the late author’s post publication additional notes and corrections. You can purchase the book here. 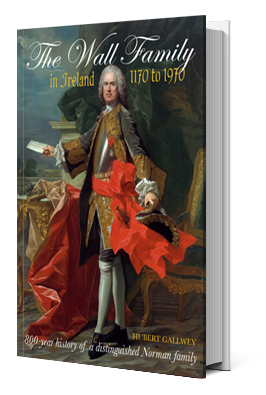 A new full-colour cover featuring Lieutenant General Richard Wall, Chief Minister of Spain (1754-1764) taken from an original painting acquired by the National Gallery of Ireland from the Naval Museum in Madrid. Text set in modern typestyles. New easy-to-read layout of the 13 genealogical tables. A loose-leaf full-colour copy of the Wall coats of arms suitable for framing. 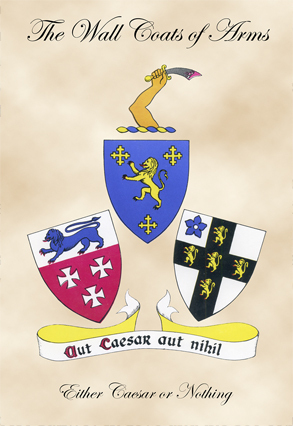 In the first edition, the coats of arms was part of the book (appendix c). A full appreciation of the life and work of the author, Hubert Gallwey.